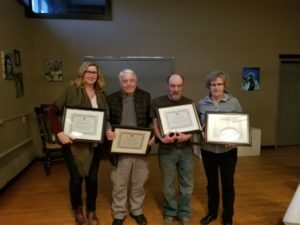 This year, four of Salmo Valley’s outstanding volunteers will be honoured with a Salmo Valley Volunteer Long Service Award at the Tuesday, April 9th Council meeting at SVYCC at 7:00 pm. This award is given to Individuals who have made significant volunteer contributions to the community for a period of at least 10 years. Melanie Mobbs – Over the years Melanie’s many accomplishments include, but are not limited to, being Founding Director, President, Treasurer, grant writer and coordinator for the Salmo Valley Youth & Community Centre Society; volunteering with the Salmo Community Literacy committee, Salmo Public Library, Emergency Social Services, Salmo Valley Pool Society, Salmo SS jr. boys basketball, swim team, and the Salmo Child Care Society. Margaret MacDonald – Margaret has volunteered for many Salmo organizations including the Salmo Recreation Commission, the Ladies Curling Club, the Salmo Rink Association and the Salmo Ski Hill and was one of the original directors that incorporated West Kootenay Minor Softball after many years running it without an actual society. Ian McInnes – In has been actively involved as a volunteer with the Salmo District Golf Course as President, Vice-President or board member since the 1970’s. Coached girls softball and volunteered for many years for the Salmo Curling Rink and Junior Curling, Salmo Ski Hill, Salmo Recreation Commission and Trail Horseman Society. Wayne Gibbon – Wayne has volunteered with the Salmo fire Department for over 42 years! He is a valuable resource that the department can always rely on, sharing his knowledge with new recruits, at fire and crash sites and always being counted on to show up.